How does diabetes affect your skin? Many people living with diabetes suffer from nerve damage, which causes skin to become severely dried out. Dry skin can lead to cracks and bleeding. Fortunately, most dry skin conditions can be prevented. With regular care and the right moisturizer, your feet can look and feel healthy for a long time. 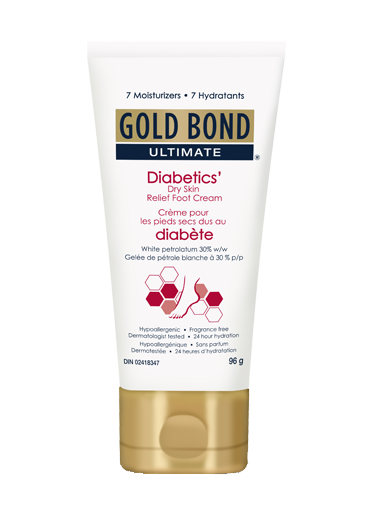 Diabetic foot is characterized by extremely dry cracked skin that if left untreated, can lead to infection. What causes dry skin among people living with diabetes? Two common complications that can lead to diabetic foot are nerve damage and reduced blood circulation. Nerve damage causes a loss of sensation in your feet, making it harder to feel heat, cold, and/or pain. This loss of sensation makes your feet more vulnerable to injury. Blood carries oxygen and other nutrients that are necessary to heal wounds. If your blood circulation is reduced, the risk of foot problems increases because wounds heal more slowly and have more time to become infected. After your bath or shower, apply your moisturizer within 3 minutes of exiting the water. This prevents evaporation of the water that was absorbed during your bathing, which prevents the drying out of the skin. The thicker the moisturizer, the less evaporation of water from the skin. Apply a lotion to your heels and soles. Wipe off excess lotion that is not absorbed. Thoroughly check your feet and between your toes daily to make sure there are no cuts, cracks, ingrown toenails, blisters, etc. Whenever possible, wear white socks (it’ll be easier to notice if you have a cut or a sore). Wear well-fitting shoes that offer support and have low heels. *Consult your healthcare professional if you have any questions about your skin concerns or treatment.